The Capacitance is determined by, among other things, the characteristics of the dielectric material. International standards speak of the Dielectric Constant or permittivity, designated by the symbol ε. A capacitor serves as a reservoir for electric charges. The size of the ”reservoir” is called capacitance and is expressed in the quantity F(arad) or As/V. The principle Figure C3-1 shows how the capacitance is directly proportional to the active area A and to the dielectric constant and inversely proportional to the distance between the electrodes. The formula in the figure is applicable to vacuum and air. ε0 = dielectric constant for vacuum (≈air) = 1×10-9/36π. Figure C3-1. The principle of capacitance, C.
If the electric charge quantity of the capacitor is designated with Q (As), then the general formula C3-1 is valid. Figure C3-2. Dielectric with its constant . εr is a relative number – the relative dielectric constant – which tells us how many times the capacitance is magnified when we exchange the air gap between the electrodes with different dielectric materials. That’s the relative dielectric constant εr which is given in technical tables and catalogues. If we change polarity in Figure C3-2 by applying an AC voltage over the capacitor, it will cause a certain resistance in the circuit, a so called capacitive reactance, XC, expressed in ohms. C = capacitance in F.
The desired miniaturization of different capacitor types can be expressed in different ways. The smallest rated voltage for electrostatic capacitors often is more than enough for the application as shown in section C4.1.4 also. Hence we usually disregard the voltage and compare the various types by means of their maximum possible C/V rate which means capacitance C per unit volume V (d * A in the Figure C3-1). According to the Formula C3-2 we get C/V = ε0 * εr * A/(d * A * d) = ε0 * εr /d2. The rate C/V will be at maximum for dmin, i.e., for VRmin. In electrolytic capacitors the rated voltage plays a greater role because it can be adopted also to very low working voltages. Here the capacitors are grouped according to their charge quantity, that is to CR*VR. We refer to the CV product. If we connect capacitors in parallel as shown in Figure C3-3 the active area (and hence the capacitance) increases with all additional capacitor elements. Figure C3-3. Principle figure of the total capacitance when the elements are connected in parallel. Figure C3-4 shows in principle how connection in series increases the dielectric thickness without changing the charge quantity. The capacitance decreases proportionally to the increase of dielectric thickness. Figure C3-4. The principle of series connection. charge accumulations on interfaces between different materials in the dielectric. As long as the capacitor is not biased, the dipoles have a random orientation, without any resulting pole. It may in principle looks like the Figure C3-5. Figure C3-5. Dipole orientation in an unbiased dielectric. If they should be subjected to an electric field strength as in Figure C3-6 they will after a specific time tend to be aligned in dipole chains. The dielectric material has been polarized. Figure C3-6. Perfectly-aligned dipole chains. The function of a versus frequency is shown in Figure C3-8 below. Because r depending on dielectric material varies approximately between two and many thousands we realize what an enormous significance the material dipoles and the polarizability plays. The velocity with which a dipole react for an applied electric field is called its relaxation time. These relaxation times range from 10-17 s for the electron dependent dipoles to several hours for the large molecular complexes. That means that the fastest dipoles keep up with all practical frequencies while the slower to a varying degree need time to contribute with capacitance-increasing dipole chains. The phenomenon can be described as a basic capacitor combined with a number of additional capacitor elements hidden in resistive circuits with shorter or longer time constants (Figure C3-7). Figure C3-7. Dipole categories in a capacitor. An example of the frequency range that different types of dipoles contribute to is shown in Figure C3-8. αi = interface dependent dipoles. Figure C3-8. Typical example of schematic variance of polarizability in a solid material with frequency. Thus, the capacitance decreases with increasing frequency. In components with large dielectric losses and a considerable percentage of inert dipoles we will learn how the impedance curve starts deviating from the nominal capacitive reactance curve when we approach the resonance frequency. Figure C3-20. If the dipoles have been ”activated” to form a dipole chain it will take a corresponding time to “deacti­vate” them at the same temperature. In Figure C3-9 it is presupposed that the capacitor first has been charged, then momentarily short circuited and finally left open. Those dipole chains which were too inert to react during the short circuiting moment kept their charges captured in the electrode. 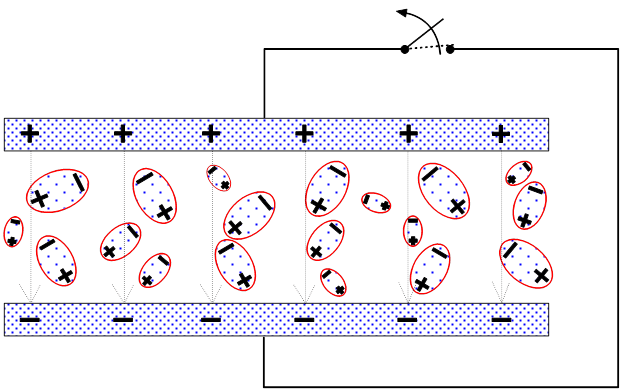 After a while in the absence of an electric field they begin to assume random, unaligned positions, releasing the captured charges in the electrodes (Figure C3-9). The released charges are manifested as a residual voltage in the capacitor and is measured in V. This residual voltage is a measure on the dielectric absorption ”DA” of the capacitor and is expressed in percent of the initial voltage applied. Figure C3-9. Effect of dielectric absorption. DA is generally an unwanted property which burdens certain dielectric materials severely, others little or quite negligibly. It may sometimes cause problems we will discuss later. The determination of DA is made by biasing the capacitor with a DC voltage for a certain period of time, then short circuiting the part over a resistor for a specified number of seconds and finally leaving it open for a number of minutes before the residual voltage is read. It is expressed in percent of the charging voltage. Voltages, times and resistances are specified in different standards which sometimes differ. Examples of how the times influence the results are shown in Table C3-1 where the records are done at 25 °C. DA increases strongly with rising temperature. Table C3-1. Examples of DA @ 25°C. Knowledge of the dielectric absorption of capacitors is often vital for optimum circuit design. Thus we will provide DA values in the part summaries following every material group. Primarily, the values are obtained based on procedures the same as or equal to either of the methods in Table C3-1 above.